Since I fell in love with Sylvain Neuvel’s giant robots and sardonic narrator in Sleeping Giants, I’ve been curious to see what he would write next. 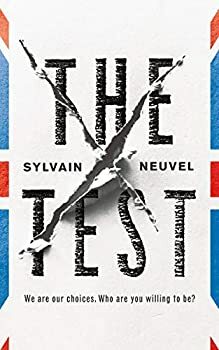 The Test (2019) is an excellent novella, quite different from THE THEMIS FILES trilogy, though some similar themes are touched on and there are similarities in the narrative technique. I went into reading The Test totally cold, without reading even the blurb ― just knowing that Neuvel wrote it was good enough for me to spend my $3.99 on the Kindle version ― and I strongly recommend doing that. But if you want a little more information about the novella’s setting and merits, this review does that without, I hope, spoiling its surprises. In a near-future Great Britain, Idir Jalil, a dentist who emigrated from Iran, is seeking to become a British citizen. The final requirement is to pass the British Citizenship Test, which Idir is taking on behalf of himself, his wife, and their two children, who are watching him from a nearby waiting room. The entire family will become citizens or will be immediately deported, based on whether he passes the test or not. It starts out like most any test, with historical and cultural questions about Great Britain that have questionable relevance to a person’s worthiness to become a naturalized citizen. Idir is nervously talking himself through the test (“What could anyone possibly do with that information? It would have come in handy in, say, 1485, if one were travelling the country. Darling, perhaps Bosworth Field is not the best spot for a picnic today.”). But then events take a shocking turn, and kindhearted Idir finds himself in an unimaginable position, where there are no good answers … though possibly correct ones. There’s nothing I can say, no good answer. I might die today, and I don’t know if it was inevitable or if I inched myself into it, one small mistake after the other. Don’t draw attention to yourself. That is what they told me. It’s too late for that. Idir is a sympathetic protagonist, thoughtful and caring even in the midst of incredible stress. Other parts of the story are from the viewpoint of a young man named Deep, a first-generation British citizen whose parents are from India. Deep is also in a stressful situation, though for entirely different reasons, but it’s intriguing to see how their cultural backgrounds inform the thought processes and values of both Idir and Deep. The British citizenship test is intended to assess a person’s values, based on the type of ideology that modern society often places a premium on: consideration for others, helpfulness, absence of sexism and racism, environmental consciousness. The irony is that the government’s testing methods and practices contradict these values while paying lip service to them, a point that’s driven home by the story’s epilogue. The Test is a quick read at 110 pages, and I couldn’t put it down. It’s psychologically complex, sobering and disturbing. It made me think about how things that initially seem like a good idea can go wrong when there are inadequate checks and balances, and about unintended consequences. Highly recommended. I like what I've seen of Fireside. I haven't read it, but I really like her writing. “The Last Banquet of Temporal Confections” by Tina Connolly is fantastic! I am hoping “A Witch’s Guide to Escape: A Practical Compendium of Portal Fantasies” in Apex wins, especially that Apex is going on hiatus. Hopefully a win's publicity will help them get back on their feet. Not to mention it's an awesome story that deserves to win!! !